The first forerunners of skiboards were “bigfoots” produced by European company Kneissel Dachstein, which appeared already in 1991. Then the development moved to the USA. Skiboarding came through next progress. there thanks to the firms Canon Skiboards, Klimax Skiboards, Line Skiboards. The best era of skiboarding culminated in including the competitions in the X Games series. After this significant success, many ski producers have got interested in skiboarding. They started to introduce their skiboard products. Unfortunately, not in all cases it turned out well. Also this was the fact why the skiboarding got out of the focus a bit. Majority of so called skiboards on the market is equipped with plastic binding drilled directly into the body of the ski. Therefore in case of damage you can throw out whole set. The authentic skiboards are short, wide, with wooden core and with lifted both ends. They allow skier to carve in the same way as on snowboard, run through the deep snow, run backwards, safely run between moguls and even jumping in a snowpark. 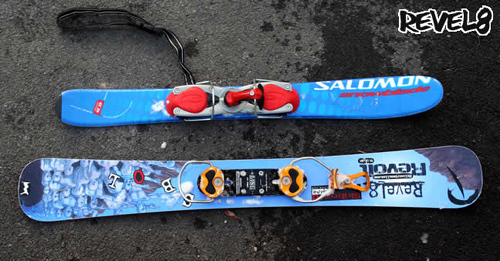 Binding: Authentic skiboards should have support replacement of binding (board). The body of skiboard is equipped with 4 screw holes with scroll during the manufacturing. The holes are placed in square, 4cm apart in the middle of the length of board. It allows effortless replacement and even supports right springing of the board during the carving. Many kinds of bindings are produced for this standard. As the binding is just in the middle of the board, you can better control skiboards during the run backwards. And you are generally more stabile as well. All-metal binding transfers the energy from the boot to skiboard in the better way and it’s more durable of course. Width and length: Skiboards resemble smaller snowboards. They have wide both ends and are narrowing to the centre. The width is important feature, which has influence on skill in deeper snow in a great way. The length of skiboards differs between 60 – 120 cm. The choice of the length depends on requests of the user. Preferences vary and people choose what is better for them. Longer boards are more stabile during faster run, are fain for using in deeper snow and also are surely better for landing after jump. Shorter are on the other hand more versatile and certainly a bit safer in the case of fall. Tip and tail: The high of tip and tail is very important especially concerning skiboards. As they are quite short it’s important to have the ends of the board sufficiently lifted in order not to be stopped by all kind of clod on the ski slope or sudden deeper snow.